BJP National General Secretary and Spokesperson Jagat Prakash Nanda has demanded a high level judicial inquiry into the serious allegations made against Congress President Sonia Gandhi’s son-in-law Robert Vadra’s meteoric rise in his fortunes since the UPA came into power. 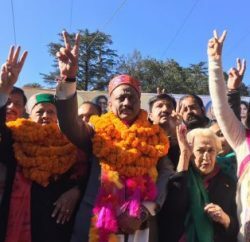 In a statement released in Shimla, JP Nadda said the people of India have a right to know stupendous rise in Vadra’s wealth coincided only with the rise of Congress-led UPA in power. According to allegations leveled by Arvind Kejriwal, Vadra became director of 3 companies each in 2007 and 2008 while in just three months between June and August 2012 he became managing director of 6 companies. Nadda said it is a clear case of accumulation of wealth beyond known sources of income. In Andhra Pradesh Jagan Mohan Reddy is behind bars for the last over six months for similar charges. Jagan is the son of a former Chief Minister while Vadra is the son-in-law of Sonia Gandhi. Nadda said that in the past even chief ministers in office or former ones, like Lalu Prasad Yadav, Mulayam Singh Yadav and Mayawati have been hauled up for possessing assets beyond known sources of income. How can then Vadra enjoy immunity on this account, Nadda alleged. Taking exception to the Congress leaders, including Finance Minister P. Chidambaram, defending Vadra, Jagat Prakash Nadda asked Congress to explain whether Vadra empire is the proprietor concern of the Congress that its leaders know each and every detail of the business transactions and can vouchsafe for their legality? Jagat Prakash Nadda asked, is the Finance Minister trying to legalise “corruption” because it is being indulged in by the son-in-law of Congress first family? If the allegations against Vadra involve only “business transactions” or loans as Congress spokespersons have tried to explain away, Nadda argued, the same holds good in the case of other cases, including those of Jagan Mohan Reddy. Then why the CBI and UPA government is discriminating between the Jagan case and Vadra case which for all practical purposes appear identical, he asked. BJP leader claimed that it is the rarest of the rare case, in which a person who is not holding any public office has been exempted from searches at the airports and is allowed to proceed in and out from the green channel. This prerogative is not available even to some holders of constitutional offices but stands extended to Vadra only because he happens to be the son-in-law of Congress President Sonia Gandhi. 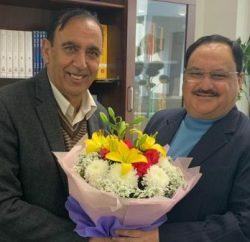 Nadda said it would be a bad day for democracy in India if any person against whom serious allegations have been leveled, allowed to get away by dismissing the allegations as just “politically motivated aimed at character assassination”. The people of the country have a right to know the real facts and this can be achieved only through a free, fair and impartial inquiry that inspires public confidence.